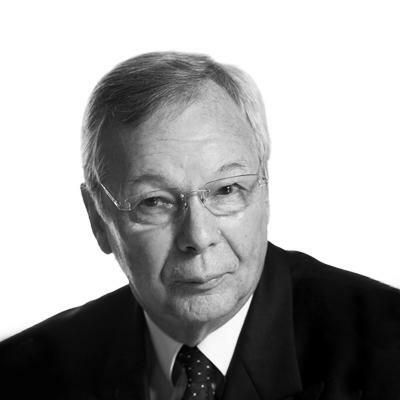 Mike Fairley founded L&L in 1978. Below he discusses the impact it has made and how it helped build a global industry. 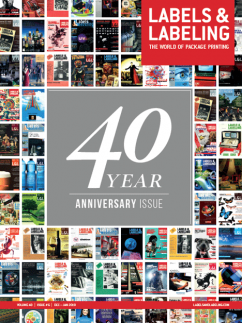 Mike Fairley (MF): My involvement in the worlds of printing, paper, packaging and labels actually had its beginnings some 10 years before the magazine was launched. Indeed, for much of that time I was regarded as one of the world’s leading international specialists in health and safety in the printing industry, and on materials handling. This rather unusual beginning to becoming a dedicated label industry writer and speaker started back in 1967 when I was undertaking post-graduate study in further and higher education at Garnett College of Education, prior to becoming a higher education college lecturer. Part of this study involved the writing of an extensive research thesis – which it was decided should be on health and safety at work. Following discussions with Her Majesty’s Inspectors of Factories, I was handed some 80,000 printing industry accident return documents for analysis, which I undertook by gender, age, type of accident and injury, time of day, day of the week, etc. This was followed by research at St John’s Hospital for Diseases of the Skin in London, specifically looking at printing inks, chemicals and solvents that caused skin infections and skin diseases. The end result was a thesis that was subsequently recommended for publication as a reference source for industry. Indeed, this was my first book, entitled Safety, Health and Welfare in the Printing Industry, which was published by Pergamon Press in 1968, followed by a second title on Materials Handling in the Printing Industry in 1971. Publication of these two books led to requests to write articles for various print magazines and for the National Graphical Association’s newspaper ‘Print’. I was subsequently asked by the International Labor Office in Geneva to be the contributing author on everything to do with health and safety in print in their latest Encyclopedia of Occupational Health and Safety, a global reference source on the subject. By the early 1970s, I had joined Pira (the Paper, Printing and Packaging Industry Research Association) as deputy head of training. This involved finding speakers and often chairing and speaking at some 35 or more seminars, conferences and teach-ins a year on topics across the whole spectrum of paper and board making, printing technology and processes, packaging materials and applications – including conferences and seminars on label trends, with a particular focus on the innovations and developments in self-adhesive labels. During five years at Pira I was responsible for organizing almost 200 such events, and was also writing self-instruction manuals, visual aid kits, teaching machine programs on subjects that included Offset Printing, Screen Printing, Paper and Board Making, Moisture Measurement of Paper and Board, and the very first training aid/visual aid kit on Self-Adhesive Labels. I was also involved in the training of operators of web-offset newspaper presses, and in the introduction of computerized typesetting into the newspaper industry. When I left Pira in 1976 I had an extensive current and future knowledge base on almost everything to do with paper, printing, packaging and labels, and had industry contacts all over the world. Something that would prove invaluable in the early years of Labels & Labelling. From Pira, I joined a government body responsible for industrial training; the Paper and Paper Products Industry Training Board (PPPITB), where I was a senior training adviser and head of information services. The paper and board, corrugated, carton and self-adhesive label industries all came within the encompass of this governmentsponsored body. While at the PPPITB I also developed training material and courses for the corrugated industry and ran safety courses in paper mills. It was during this period that the label industry approached the Training Board to ask if it could help with producing a newsletter or training material on the emerging self-adhesive label printing industry. As I was head of information services, the proposal was passed to me to see what, if anything, could be done. Although the board decided that they couldn’t finance such material, they encouraged me – and provided time – to look at other possibilities. One of the people I talked to was Ron Spring, who had helped me with the writing of Pira training aids on screen printing and on self-adhesive labels. In conjunction with Ron Spring, at that time managing director of Gerhardt UK and on the marketing committee at Finat, the two of us formed Labels and Labelling Publishers in September 1978 and subsequently published the first issue of the magazine in January 1979. The rest, as they say, is history. L&L: Were there any other existing publications or conferences targeting this sector at that time? MF: In the 1970s, self-adhesive label production was a minor sector of the whole printing and packaging industries – even a small percentage of the label industry. 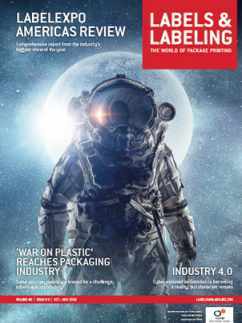 As such, it seldom received attention in the print magazines, while the packaging magazines focused on end-usage and applicator technology. Very few label industry suppliers or converters would be advertisers. Just a few sent in editorial copy. As for conferences and seminars, it was mainly the ones I organized at Pira. L&L: Before L&L and Labelexpo got together, where did these companies tend to exhibit? MF: This was very much in-line with their PR and advertising approach. They exhibited, if at all, in a few generic local or national print or packaging shows. A few of the press and equipment suppliers would participate at drupa in Europe or the Print shows in Chicago. L&L: Did you approach any suppliers with the idea of launching L&L? What was their reaction? MF: Prior to launching the magazine a mailshot was sent to around 400 industry suppliers and converters – mainly across Europe. This was based on Ron Spring’s database, as well as trawling through existing print and packaging magazines to find potential advertisers. The mailer asked if companies would send in press releases, take out advertising, participate in a buyer’s guide entry, or have a regular subscription. Such was the response, that the first issue was published on a break-even basis. It never looked back. L&L: Which suppliers still around today were the earliest supporters of L&L in terms of advertising and editorial support? MF: Most of the early advertisers and editorial supporters were local agents in the UK for the, relatively few at that time, specialist label press manufacturers, die makers, or materials suppliers. These included agent adverts and press releases for Gallus, Mark Andy, Nilpeter, Lonsdale (now Edale), Fasson (now Avery Dennison), Sterling Coated Materials (later becoming Raflatac), Gerhardt Engraving (now RotoMetrics) as well as a number of small suppliers incorporated into the Buyer’s Guide entries. L&L: What date was the first L&L issue published and how was it received? MF: The very first issue of just 1,000 copies was published in January 1979, with an initial frequency of every three months, changing at the end of the second year to a bi-monthly publication – which it still is today. In the second year we also published the very first Directory of Labels & Labelling. Finat also kindly sent a copy of the magazine to each of its members. L&L: Was L&L a global magazine from the start? How did you find your readers? 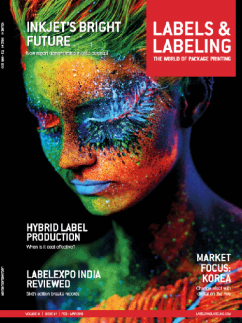 MF: From the very first issue the magazine was called Labels & Labelling International. With Finat helping to promote the magazine from the beginning, followed in the second year by Latma, the readership soon began to grow rapidly. Supplier advertisers also took copies of the magazine to their customers during sales or technical visits, and the leading industry suppliers all invited me to visit their plants and write features about them. From the beginning, the magazine had a two-fold role: to help promote a relatively new and fast-growing industry; and to educate the industry about new products, materials and technology – which tied in well with my education and training background. L&L: How did the relationship between L&L and Labelexpo come about? 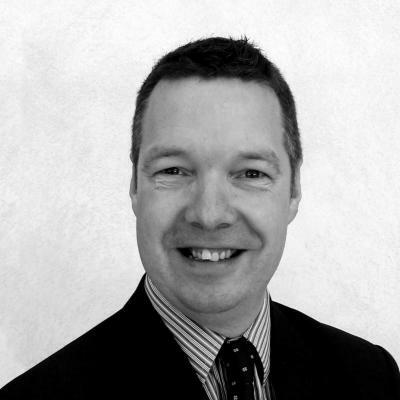 MF: This was towards the end of 1979 when Clive Smith, a former United Trade Press exhibition manager who had set up his own exhibition company, contacted me to say he was planning to launch a new niche show for the coding, marking and labeling industry, which he was calling Labelex. Sounding out these industries as to the magazines they read, he found most of them saying that the only relevant title was Labels & Labelling International. L&L: Did you also run conferences and research projects relating to the PS labels market? How did these relate to L&L? MF: With a background from running – and speaking or chairing – conferences, seminars and workshops at Pira, it seemed only natural to continue those activities for an industry desperate for information and knowledge through the platforms of the magazine and the label shows. 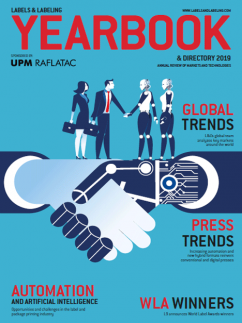 In addition, Fasson arranged for me to speak on the label market and trends at converter meetings they put together in Italy, the UK, Spain, France and even down into Australia. This was before many of the national label associations had become established. I also did in-house seminars for many of the leading industry suppliers to bring their own employees up to speed. L&L: What are the main changes in technology and label markets you have seen since launching L&L? MF: Looking back, it is interesting to see just how much the label industry has changed; from the evolution of rotary letterpress and rotary screen in the 1980s, to the introduction of dedicated label inks and UV-cured products, the growth of filmic materials, the development of thermal materials, variable printing technologies, the very first electronic origination systems, flexible dies, right up to today’s digital printing solutions. Self-adhesive labels have grown from a minor technology into the leading global labeling solution which, over the past 40 years, has continued to experience above GDP growth. L&L: You knew Stan Avery – recognized as the founder of the PS label industry – very well and interviewed him for L&L. What memories do you have of Stan? MF: I was fortunate to meet Stan on a number of occasions in the UK, Europe and America. Even well into his eighties it was fascinating to talk to him. Sitting with him in his office in Pasadena, California, we would spend considerable time discussing the industry, its growth, and the latest developments. We very much had the same thirst for knowledge and passionate interest in the world of labels. L&L: L&L sponsored for many years a Man of Achievement Award (precursor to the R Stanton Avery Lifetime Achievement Award). 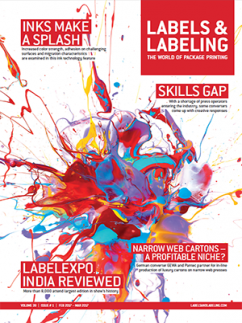 Which winners stand out for you in terms of their contribution to the development of the label industry? MF: I suppose it would have to be the real industry pioneers that created the self-adhesive industry from scratch. Stan Avery, of course, Ferdinand Rüesch Senior, Nozumo Shiwaku and Mark Andrews. Without their pioneering developments in materials and presses we wouldn’t have the label industry that we have today. 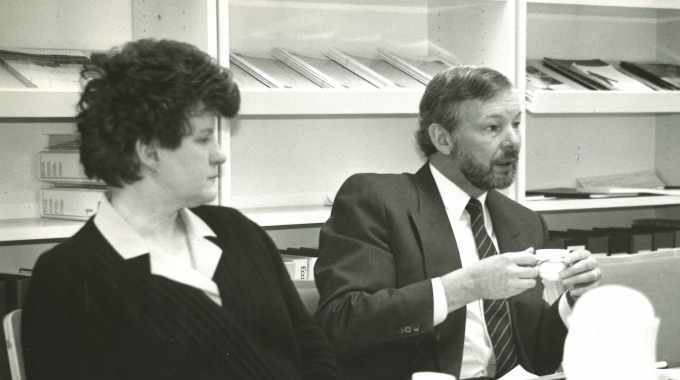 L&L: What part did you and L&L play in the development of global industry associations? MF: I would like to think it was a major role. We worked closely with and supported Finat from the beginning. I was also speaking at and supporting Latma and TLMI events from the 1980s. I regularly spoke at association meetings in Denmark and Sweden, and I was speaking at the inaugural meeting that lead to the foundation of the New Zealand Label Association (Salma). L&L: Outside the label industry, what are your main leisure interests? MF: Although not outside of labels, I should probably mention the setting up of the Label Academy and the writing of many of the Academy’s titles (10 books in my name so far, and more in the pipeline). Apart from the world of labels, I also spent some 20 years running my own sailing association. A qualified Royal Yachting Association instructor and radio operator, I would race my 11 meter yacht, Mifair Lady, with a crew of 4-6 throughout the winter weekends (whatever the weather), and in the summer would run weekend courses around the east coast and also up to St Katherine’s Dock in London, or longer trips across the North Sea to Amsterdam, Ostend, Dieppe, Calais, Fecamp or the Channel Islands. Rather different was time spent as chairman of a property company that owned a block of 52 apartments in Deal, Kent. The challenges of managing the varied interests and requirements of the many residents was a very different experience to publishing – or sailing. I also have some three acres of garden and grounds to look after. In more recent years I have been spending time writing and publishing historical and biographical research books. Rather different to writing about labels, but nevertheless satisfying to study historical records often going back hundreds, or sometimes thousands, of years. To find that I have relatives that were prominent cotton and wool manufacturers during the Industrial Revolution, and that I have an Olympic Gold Medalist and variety artist and comedian grandfather, have been eminently rewarding. There are still more books that need writing – both labels and historical. Looking back over 40 years of labels must take pride of place however. That’s where half of my life so far has been involved. Hopefully, there are a few more years still to come.